Goalmill Milling Cutter » Sumitomo Electric Carbide, Inc.Sumitomo Electric Carbide, Inc.
Cutter with tangentially-mounted, screw-lock inserts developed for high efficiency roughing and finishing of cast iron component. Goalmill features a multi-edge design (approximately three teeth per inch). GFX and GFS for finishing are fitted with easy-to-use cutter runout fine tuning mechanism for adjustment of 5μm or lower runout. Chipbreaker ‘arc’ shaped style inserts for low cutting force. 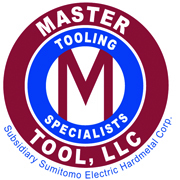 Master Tool, LLC. can provide custom-made milling cutters to accommodate your specific applications and needs in custom tooling.